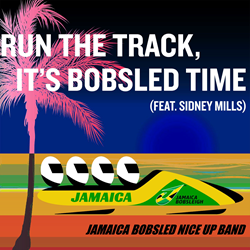 The Jamaica Bobsled Foundation (JBF) has announced the release of “Run The Track, It’s Bobsled Time” – an officially sanctioned team song to raise funds and awareness to benefit the ultimate underdogs – the athletes who compete in the sport of bobsledding and skeleton in the Winter Olympics for the country of Jamaica. The dancehall pop anthem is available globally on all download and streaming services just in time for the 2018 Winter Olympic Games in PyeongChang, which marks the Olympic debut of the Jamaica women’s bobsled team and skeleton athlete, coincides with the 30th anniversary of the original Jamaica Bobsled team’s Olympic run and the 25th anniversary of the iconic film “Cool Runnings.” Proceeds from the track and video will benefit Jamaica Bobsled Foundation, who teamed up with music supervision company Groove Guild to create the track and companion music video. The video features Jamaican dancehall crew Ravers Clavers who choreographed and performed a new dance called the Bobsled Slide. The dancehall pop anthem was written and produced by roots-reggae master Sidney Mills (Steel Pulse) and producer/songwriter Jon Notar (Blondie, No I.D. ), with additional producing credits going to Paul Riggio and Al Risi from Groove Guild. “Run The Track, It’s Bobsled Time” features percussion by reggae legend Larry McDonald (Bob Marley and the Wailers, Lee “Scratch” Perry). Lead vocals are by Mills and include rousing callouts inviting all to come together and support Team Jamaica.